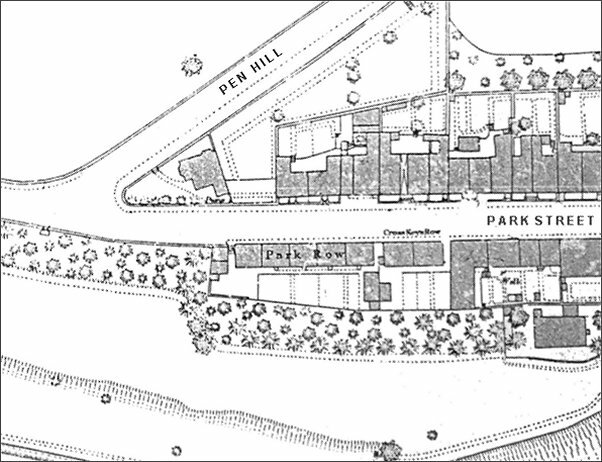 Park Row was a short row of five dwellings on the south side of Park Street, just east of the junction with Pen Hill. The houses are not shown on either Madeley's map of 1831 or Day's map of the same year, but are shown on Bidder's map of 1843. They were demolished in the 1960’s as part of the Park Street widening and today the site is at the side of the road with a few sparse trees. This map, based on the 1886 Ordnance Survey, shows the junction of Pen Hill and Park Street (although this section of Park Street was sometimes called Belmont). Park Row is seen at centre.